Rather than a more pure dirt-bike, I chose the BMW for it's mechanical reliability, comfort and fuel efficiency and then made it stronger. 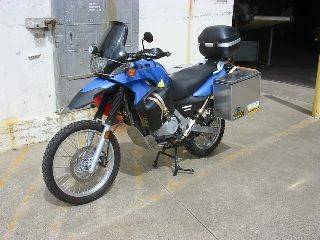 Nearly ever other big single is lighter and with some with better suspension, but I expect to cover approximately 100,000kms throughout the world and most of the time I can't avoid being on bitumen or at least roads that can be traversed by a 2wd car, which the Dakar will more comfortably do. Most people accept that the Rotax engine would cover many more kilometres before it would need to be rebuilt, and so I trust it more. Also, fuel economy for most singles is around 13-20km/l whereas the F650 is 19-29km/l, plus carrying less fuel for long sections will help even out the weight disadvantage. The dimensions of my aluminium boxes are 420mm(L) x 220(W) x 380(H) using Touratech mounts to the 19mm tubing of my design. Suspension has been firmed up with Touratech's harder progressive fork springs and a harder Eibach shock spring. 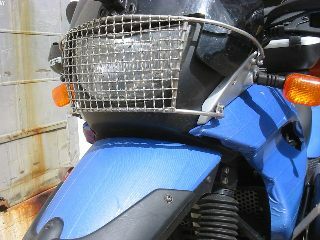 The bike is covered in blue tape to make it look more plain and less valuable. A 12v accessory output from BMW's existing plug powers a cigarette lighter to charge my phone and for a small AA battery charger since my torch, head-torch, GPS, and CD Walkman/Radio all use AA batteries. 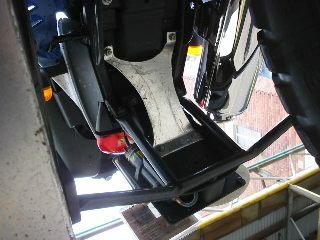 F650s have a catalytic convertor inside the muffler as standard which can be damage if Unleaded fuel is not used. 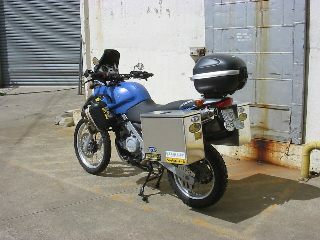 I have fitted a lighter and stronger Australian made Staintune muffler (www.staintune.com.au). 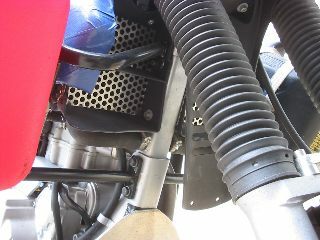 The engine is 20 times better with this exhaust, not just because of an increase in power but because F650 engines are renowned for being high revving, and the Staintune gives the bike a great improvement in low-end power, performing as if BMW's fuel injection mapping was designed for this exhaust. Cockpit. Stronger Renthal handlebars replace the original steel bars, but the original heated grips can only be used with OEM bars, so they've been replaced with Oxford heated grips which do not generate even 50% of the heat that the original grips. Running these handlebars also allows use of aluminium reinforced handguards, and replacement bars can more easily be sourced if need be. The mirrors are Acerbis's folding enduro mirrors - very strong and able to be folded down out of the way, and give a good vibrating view of your chest. With 1,000s of Kms to come I'm running a Scottoiler Touring Kit to increase chain life, the Touring Kit having an increased reservoir capacity for a range of around 8000km before refill. Scottoilers are vaccum operated from either the carburettor or inlet manifold (if fuel injected) and have an oil flow rate adjuster to suit the conditions eg. Increase for off-road or in rain. Scottoiler claim to increase chain life by up to 7 times, but even if only double the life it will be worth it's money, I'll let you know! Not to mention an increase in fuel economy, and when arriving at a pub you can forget your chain and walk straight in for a beer! 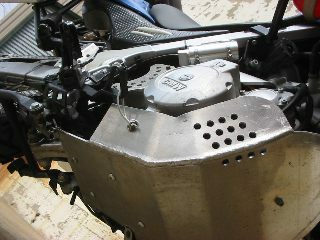 The bashguard (4mm) and chain-guards (3mm) i manufactured myself. To stop the gear lever or rear brake lever from being bent excessively, and possibly breaking, I've drilled holes in each of them and looped 3mm wire to a clamp on the bashguard. The original gear lever does not have a folding tip, so I had an old one welded onto the gear lever.